By now, anyone working with G Suite for Education knows Google Forms and likely uses them in class. This post is to introduce a “How-To” Slides deck with animations. The deck can be copied and modified and is intended to be used as an extended-length workshop on using Google Forms in the classroom. 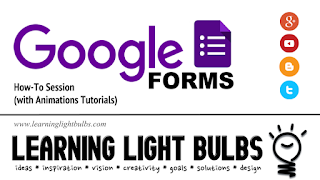 However, for anyone interested in getting deeper into Google Forms, maximizing the app in (and out of) the classroom, this may be a useful tool for you. Note the first slides that have some links to practical ideas for using Forms in the classroom. Feel free to make copies and modify to suit your needs. Note that one can click links in the Table of Contents for easier navigation of the deck. Click here or on the image below access the Slides deck. Click the image to access the Slides deck. Good luck making Forms an effective learning tool in your classroom! Thanks for sharing such an in depth resource. Nice work. You covered it all--thank you for the great resource! Thank you for sharing a great resource! A big thanks for sharing this comprehensive resource. I love Google Forms! One of my favourite things to do is to create a study quiz for my daughter. I set it up so that if she gets the wrong answer, she will receive a prompt explaining why the answer is incorrect. I've also created Google slide quizzes where she can not complete the quiz unless she gets all the answers correct. The way that you can look at the data from the Google form results is also very helpful!